Since this is the week of pink and red desserts, I thought I’d share my crepe cake from the baby shower I hosted back in June. I couldn’t throw a French party and not pay homage to the crepe. Crepes are woven through my happy memories of Paris (as gelato is through my memories of Italy). Unfortunately, despite my desire to make (fast, easy) crepes more often (expressed last time I made a crepe cake), there has been little of it. There certainly hadn’t been another fabulous layer-upon-layer crepe cake, until I decided to throw a French-themed baby shower. 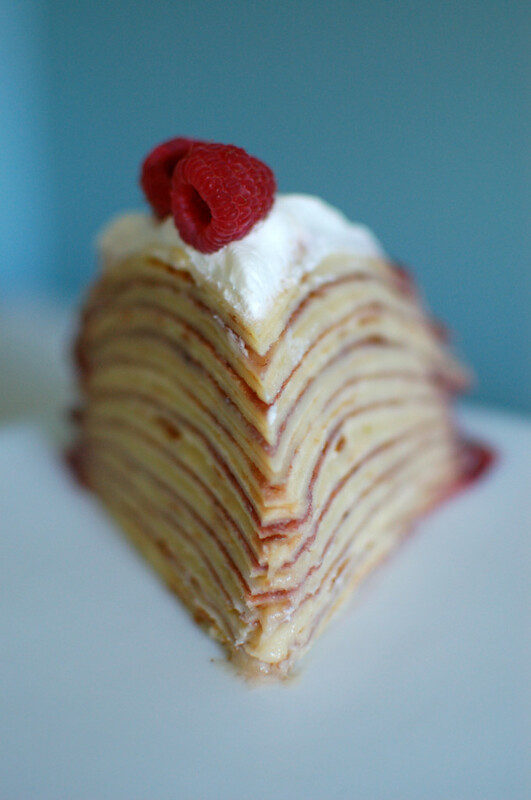 My only hesitation in choosing a crepe cake was that they’re often a lot shorter than their traditional two-layer counterparts, and (silly as it is) I love a show-stopping cake. I tried to counteract this by using 20 crepes and globs of filling, but I’d advise going a bit thinner with the filling for stability’s sake. This cake definitely takes work, but it’s worth it. The recipe can be broken into steps and partially made ahead — something to love about any recipe! I made the crepes weeks ahead of time and froze them (in a stack, without anything between them), then made the custard a couple days ahead and kept it in the fridge (actually, my mother-in-law made the custard, which she used to make mini eclairs for the same party). I assembled the whole cake the night before the party, but it would really be better assembled the day of. The jam soaked into the crepes more than I would have liked. It does take some time to assemble, so if you’re as buried in details as I usually am on the morning of a midday party, you might want to save it for a less-rushed evening event or a birthday dinner. 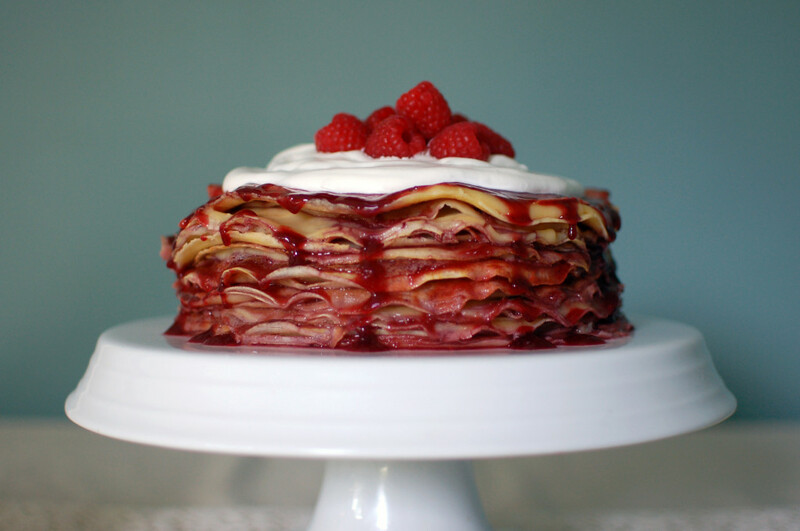 I couldn’t find a crepe cake recipe that met all my criteria (without chocolate or alcohol or lemon), so I pieced one together. 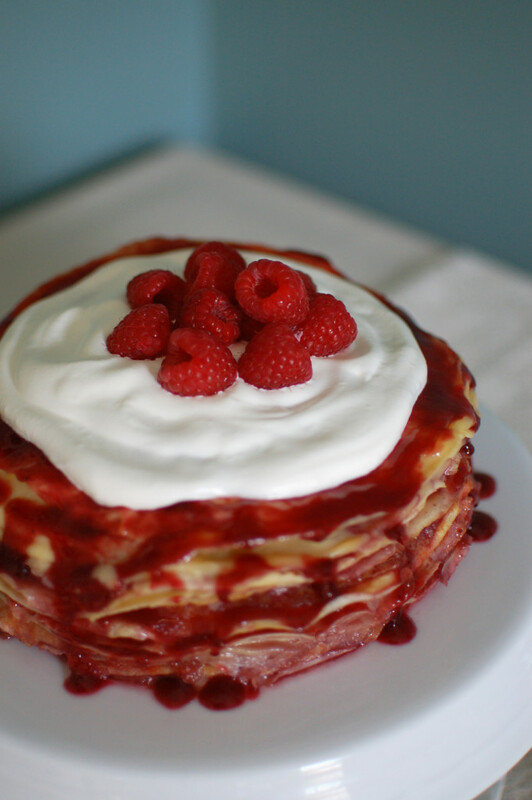 You can use anything you want between layers of a crepe cake, really, but I thought this combination was the perfect mix of light, fruity, creamy dessert! 1. If your raspberry jam isn’t seedless, warm it briefly in the microwave before using a spoon to push it through a fine strainer. 2. Center one crepe on plate or cake stand. 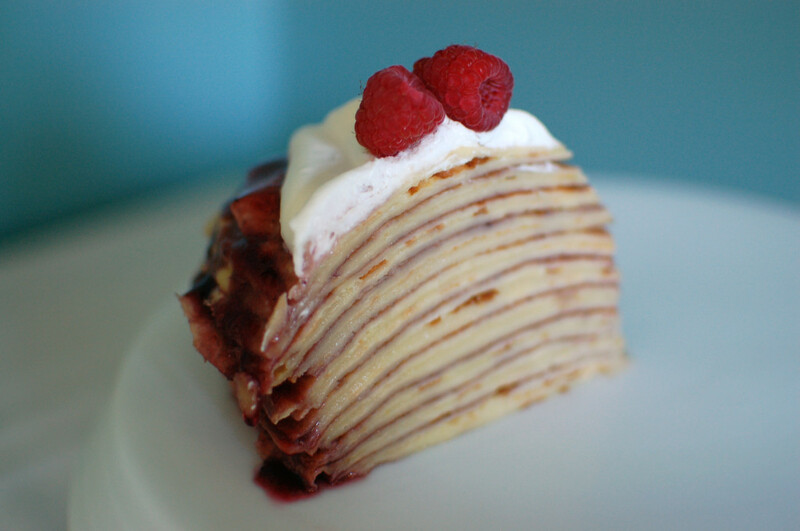 Spread a thin layer of raspberry jam over the first crepe. Top with a second crepe. Spread a thin layer of custard over the second crepe. 3. Repeat with as many crepes as you have, remembering to save a pretty one for the top. 4. 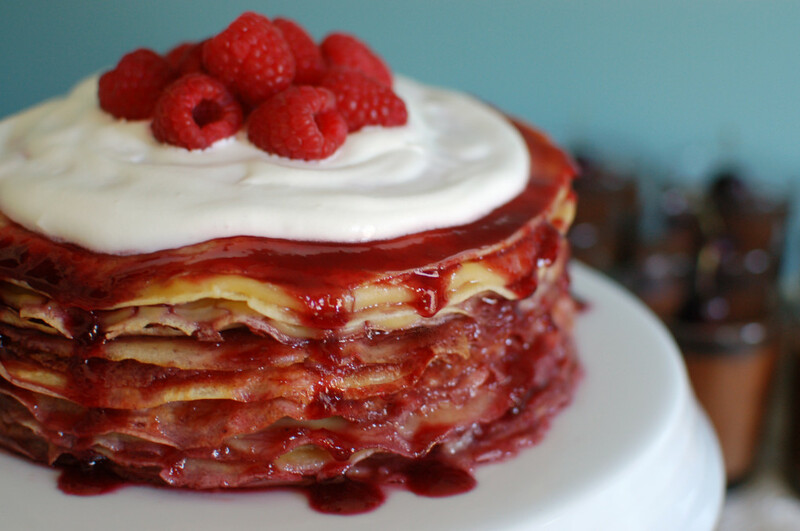 Garnish with fresh whipped cream and raspberries or powdered sugar, if desired. 5. Refrigerate briefly, or serve immediately. Cake will be slightly soggy on the second day. Note: I’ve had a few disasters with custard-making, so you may want to watch a few videos if you’re also new to it! It can be tricky to heat the eggs without getting scrambled egg chunks in your finished product (and many recipes call for straining the final product to make it as smooth as possible). 1. Heat milk in large heavy saucepan until bubbles appear around edge. 2. Beat egg yolks and sugar in large bowl with wire whisk or mixer until pale yellow and thick. Beat in flour until well mixed. Gradually beat in hot milk; pour all back into saucepan. Cook, stirring constantly, over moderately high heat until mixture thickens and comes to boiling; lower heat. (Mixture will be lumpy in the beginning, but lumps disappear during cooking and stirring.) Continue cooking 2 to 3 minutes, over low heat, stirring constantly. Mixture will be quite thick. Remove from heat. 3. Stir in butter and vanilla. Place a piece of wax paper directly on surface of filling to prevent skin from forming. Chill at least 2 hours. If filling becomes too stiff after it’s chilled, gradually stir in 2 to 4 tablespoons cream or milk, 1 tablespoon at a time. I love your idea. I wonder if you can’t use a pudding powder to make the custard, just using a bit less liquid? I know it won’t be as delicious as home made custard, but might still work.